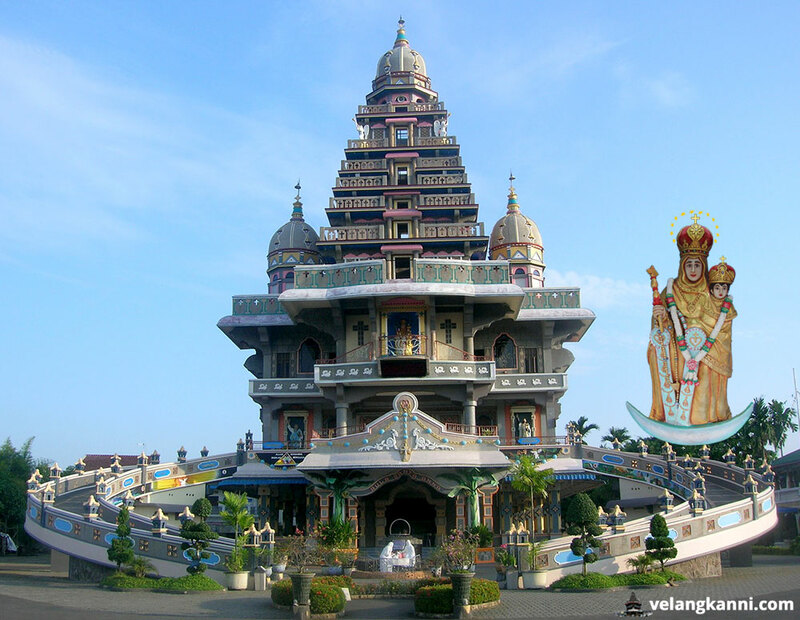 The magnificent Marian Shrine of Graha Maria Annai Velangkanni is dedicated to the Blessed Mother Mary who is known in India as Annai Velangkanni Arokia Matha (Our Lady of Good Health). Graha means home or sanctuary or shrine in Sanskrit. 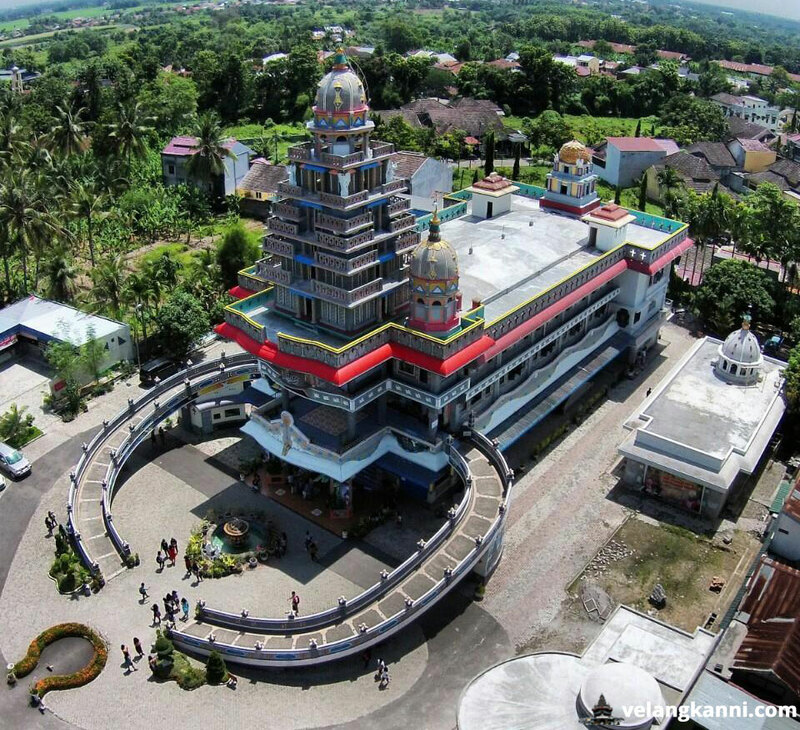 Built in 2005, it is located on the outskirts of the city of Medan in the North Sumatra province of Indonesia. Built with an Indonesian touch, the architecture of this shrine is totally different from the norm and the uniqueness of this lofty and imposing structure lies in the originality of its Indo-Mughal architectural blend, in its ornaments and display of colors done by amateur hands and above all in its Biblical content. Several religious symbols adorn the building, but these are in harmony with the structure of the shrine and form a beautiful unity. Aesthetic and religious values blend in to express the loftiness and the great mystery of the divine majesty. If you feel that you would like to go on a pilgrimage, then this Marian Shrine of Annai Velangkanni would be a good choice. 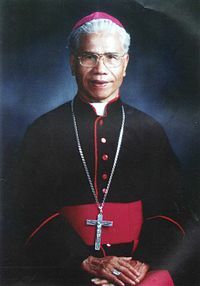 The originator of the Shrine is Father James Barathaputra, SJ. He is a Jesuit priest from India and had served in Indonesia for more than 50 years. What kind of church did Father James dream of? Father James dreamt of a Graha Maria (Marian Shrine) to be a CHURCH OF PROCLAMATION – to spread the Good News of Jesus and devotion to Mother Mary. He had a vision to make the Graha Maria a place where everybody of all races and religions, rich or poor can call home – to seek peace, solace, healing and divinity. Hence there are no visible Catholic symbols or features externally. Towards this end, he wanted a Church that is unique – where Catholics can reinforce their faith and non-Catholics can experience and learn about another faith in an environment where their respective faith is also represented in the features of the building. The Indo-Mughal design makes it look like a church, temple and mosque all in one. The Graha Maria seeks to teach humanity the story of Salvation History of mankind, based on the Bible and the teachings of the Church through its format, symbolism, ornaments, sculpture and paintings. 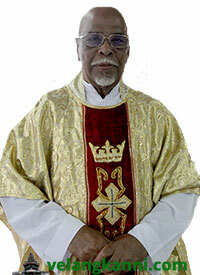 Msgr AG Pius Datubara OFM Cap. The shrine was conceived to be a place where heaven and earth meet and where God Almighty, the Trinity of Christian faith would like to meet human beings of good will to give them a taste of the divine. The Medan Archbishop Msgr AG Pius Datubara OFMCap showed a keen interest in the project and actively encouraged Fr. James with his vision for the church. Plaque placed near the hall entrance. It is a dream come true and also a miracle that Graha Maria Annai Velangkanni could be completed. There were no fixed financial backers, no building committee for fund raising, no qualified designer and architect, no professional contractor and no real artist to do the paintings and relief works, except a highly qualified Catholic engineer, Dr. Ir. Johannes Tarigan who offered his services free to work out the structure and supervise the construction of the building. Graha Maria Annai Velangkanni was built by the hands of amateurs and relied on funding from donors. But as it turned out, the fact that God was behind all these efforts to create such a beautiful church and community hall is plain for us to see. Miraculously money kept flowing in to the point that construction works started with only USD 12,000 and there was no holding back. Once construction started, money was not the stumbling block. Whenever money was needed for the building, it was there for the taking. It just kept flowing from benefactors of all races, religion and nationalities. 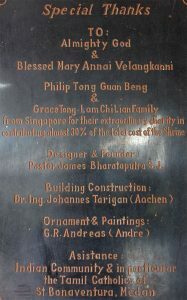 The total cost for the construction of the church was 4 billon Ruppiah (USD 500,000) which is very low considering the magnitude of the building and 60% of the funds came from Indonesian donors, 10% from India, Malaysia and Singapore and 30% came from a single Chinese family in Singapore (Philip Tong Guan Beng & Grace Tong-Lam Chi Lian). When the building was completed, money stopped. Inspired, motivated and guided Fr. James from the time the idea was conceived till the final completion of the building of Graha Maria. Having relieved of all the parish commitments, Fr. James had concentrated only on this project during the four years of the shrine’s construction (from September 2001 to September 2005). Through planning, playing the roles of an architect and employing ordinary workers on daily wages he supervised the the construction day in and day out. 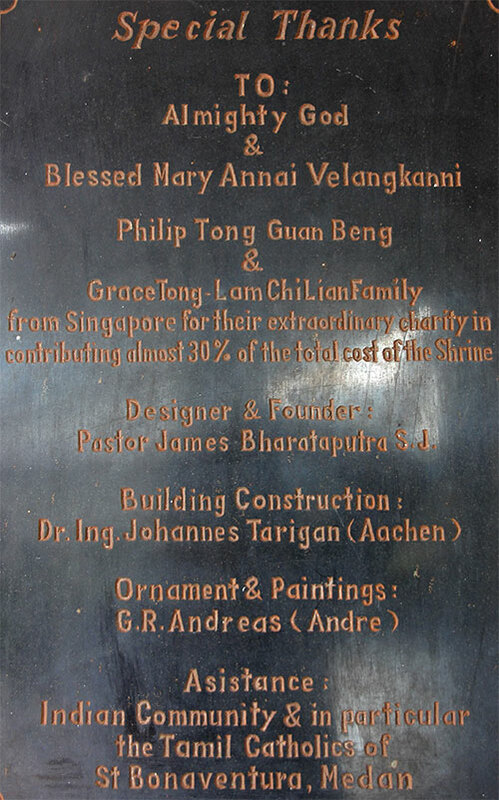 On October 1, 2005, the Graha Maria Annai Velangkanni was inaugurated by the Vice Governor of North Sumatra Province Dr. Rudolf Pardede and Medan Archbishop Msgr AG Pius Datubara OFMCap. A pilgrimage is a Christian devotional practice with an ancient tradition and history. The faithful go on pilgrimage by journeying to shrines and sacred places to pray there and draw closer to God. Places of pilgrimage are often marked by God’s special intervention or have a particular importance in the religious history of a people. Shrines dedicated to the veneration of Mary, the Mother of God or to a particular saint are common places of pilgrimage. Pilgrimages, in all their multiple aspects, have always been a gift of grace. The Graha Maria makes you feel at peace with yourself and with the world surrounding you. Not only Catholics can come and visit, people from all religious backgrounds, nationality, regardless of color and creed can come and seek for spiritual healing here, or whatever it is they are looking. Graha Maria Annai Velangkanni – You are a Phenomenon in our times and a Home for all people of good will irrespective of race, creed and mother tongue who come to experience peace, harmony and fellowship. We wish you enjoy your tour of the shrine, feasting your eyes on this “Something Beautiful from God“.